Manchester Calling 2: Wolfe Tone, the YCL and a hot summer in London | Come Here To Me! « Branching out beyond the black stuff. Jay Carax will be in Manchester for the next two months but he’s hoping to post irregularly on Dublin and Irish related topics. Found this today while helping to catalogue some of the Young Communist League papers. Connolly Association (1976). Scanned by Jay Carax. 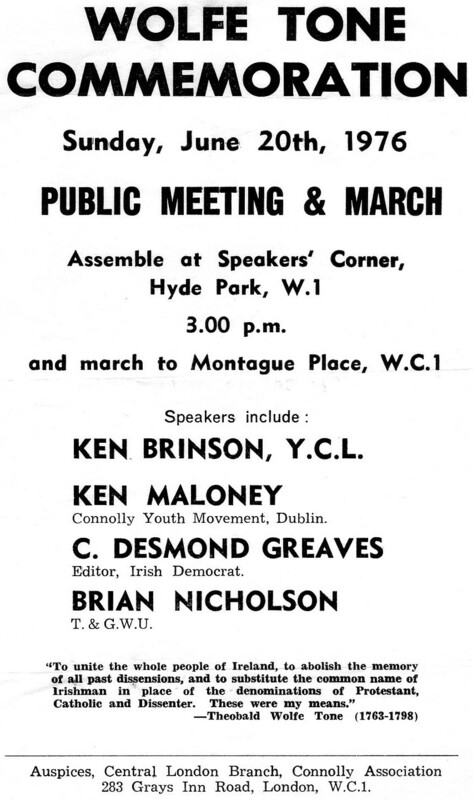 The next file was a letter from the Young Communist League (YCL) to the Connolly Association asking them why Ken Brinson was down to speak as he hadn’t been asked! I’m not sure if the problem was resolved. I can’t find anymore information online about Ken Brinson or Ken Maloney. Though I was saddened to find out that Brian Nicholson might have been a M15 informant at some point. Hi Dan. Thanks for such an interesting but sad comment. RIP Ken Brinson.